The bread group I joined a little over a year ago disbanded at the end of the year, so one of the members and I decided to start up our own bread group so we could continue to challenge ourselves to step outside of our comfort zones and try new techniques or recipes, which is something I am always wanting to do. We kept the theme for our first meeting simple: bake any kind of yeasted bread. It was a small group, but successful. So we decided to keep going with it. For our second meeting, we decided to make rolls. I will often shape my regular bread recipes into rolls and bake them that way, but it is not often that I make a recipe that is a particular kind of roll. I wanted to make something different from the bagels, bolillos, and buns that I had already made so I looked through my files and ran across a recipe for onions rolls (pletzlach) that I had bookmarked a while ago and I decided to make them. They turned out surprisingly well, and the process was not overly complicated or fussy. I took them to work the next day and they disappeared quickly. They were a little sweet to my taste, even after I cut the amount of sugar in half, but no one else seemed to mind that. I might drop the amount to 1 tablespoon the next time I make them to see if there is a significant difference. And I will be making them again. In a large bowl, add the yeast and sugar to the water and mix well. Add 360g (3 cups) of the flour and mix well. Cover and let sit for 30 minutes. Add the egg, 1/4 cup of the oil and the salt to the sponge and mix well, until the dough is soft but not sticky. Add more flour if necessary. Put the mixture into a greased bowl, cover, and let rise for an hour. Punch it down and let it rise again for 30 minutes. Heat the oven to 350°F. Combine the onion, remaining 2 teaspoons of oil and the poppy seeds and set aside. Divide the dough into 20 balls. On a floured board, roll each ball into a circle about 2 or 3 inches in diameter and about 1 inch thick. 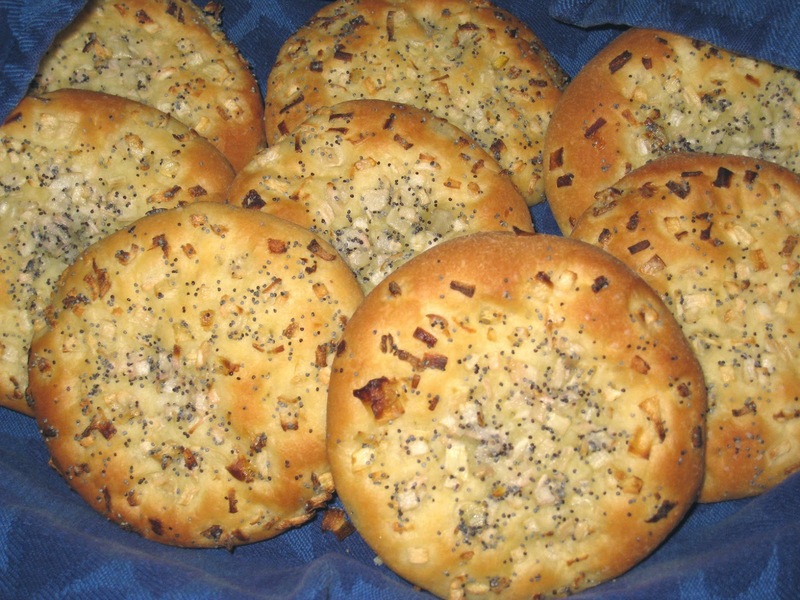 Sprinkle a tablespoon or so of onion-poppy seed mixture on each circle. Roll circles again, to a thickness of about 1/8 of an inch. Prick each circle with a fork and sprinkle lightly with kosher salt. Transfer to 2 ungreased baking sheets. Bake for about 20-25 minutes or until golden brown.